“We need hope but the one thing we need more than hope is action. Once we start to act, hope is everywhere. Greta Thunberg, 16-year-old student climate activist https://www.ted.com/talks/greta_thunberg_the_disarming_case_to_act_right_now_on_climate? This community conversation will re-frame the climate crisis from young people’s perspective and will introduce research focused around re-calibrating ‘deep frames’ for a hyper-response to climate and environmental change. 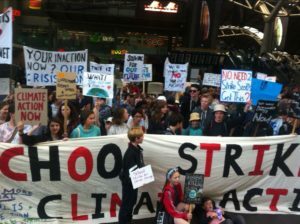 The students will be joined by Creswick resident Dr Elizabeth Boulton, whose research focuses around reframing Climate and Environmental Change as a new type of security threat, a Hyperthreat. This involves a new way of thinking which draws upon a new field called post-human philosophy. A “Hyperobject/threat” lens allows us to think in a quite different way. Elizabeth is currently developing a cutting-edge community model for mobilising climate action and sees young people cutting through rhetoric and calling it as it is. Elizabeth’s research has found that the deep framing problem is larger, more entrenched and multi-faceted than expected. However, some new conceptual ‘life-rafts’ do exist. These new ideas are embryonic and experimental, nonetheless, in accordance with ‘Real Options analysis’, they may still expand the responsive space humans have at their disposal. 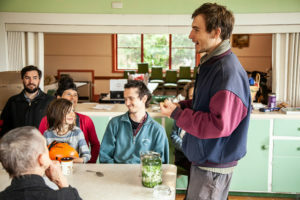 The Housing for Degrowth book launch is also part of the Sustainable Living Festival, with Castlemaine’s Anitra Nelson . More information below. Fix your favorite clothes- have you got a favorite garment that you can’t wear any more? Don’t throw it away. Bring it along and find out how easy it is to repair clothes. 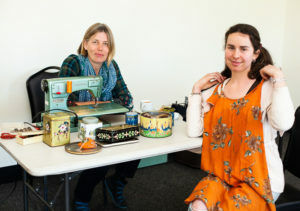 Bring along broken household appliances, broken picture frames, book binding, furniture, sewing, darning etc. Repairs, tea, coffee and food all for a small donation. Note: No Cafe in March due to State Festival. Climate Emergency, Mt Alexander Shire Council:After an initial meeting with mayor Bronwyn Machin, the aim is for the shire to adopt “Climate Emergency” status. Council has to date divested only 60% of its investments away from fossil fuels. We want to know what Council is going to do with remaining 40%. Fund Raiser film: The Reluctant Radical is a heart warming, but hopefully not global warming, American story about long time environmentalist and activist, Ken Ward. Plans are for this film to be a Castlemaine Fringe Festival event. “Captain Arthur Phillip, commander of the First Fleet of eleven convict ships from Great Britain, and the first Governor of New South Wales, arrived at Sydney Cove on 26 January 1770 and raised the Union Jack to signal the beginning of the colony. The legal basis for this invasion of Aboriginal lands was called terra nullius which translates from the Latin as ’empty land’ or ‘no man’s land’. Stone and timber villages, swidden agriculture, elaborate aquacultures and diverse bioregional culture making was trammelled and disappeared so as this imperialist legal term could be employed back in England. The employment of the term was so obviously an opportunistic fabrication by the British state and yet the day, January 26, is still used as a day of national celebration in Australia. 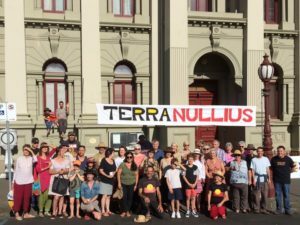 To redress this colossal deception, the annual Terra Nullius Breakfast was started in Daylesford in 2017, and was a first of its kind in Australia, joining the ever growing Change the date and Invasion Day movements. Fee:$200 for full price, or $180 with the Early Bird Discount if booking and payment is made before the 1st February. All bookings must be made by the 27th February. Spend two days with local bush tucker expert, Aunty Julie, as she introduces you to the diverse edible native plants, fruits and herbs of Australia. The workshop includes morning & afternoon tea, plus lunch, over both days. A unique learning experience, sure to ignite your interest in creating with local ingredients. 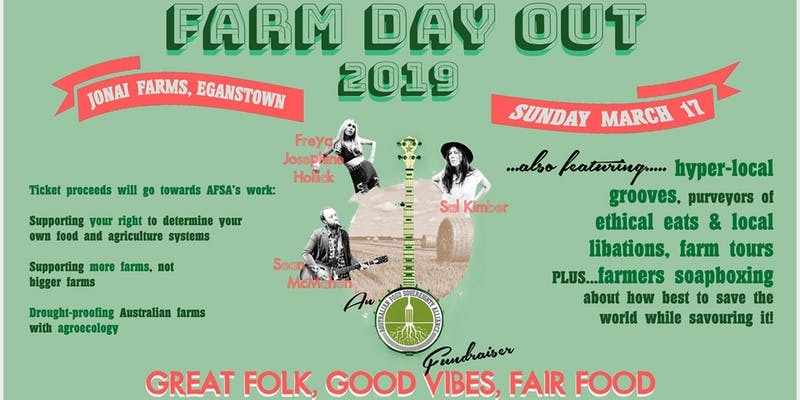 The Australian Food Sovereignty Alliance is hosting their inaugural fundraiser Farm Day Out at Jonai Farms, with a stellar line up of Australian bands, local food, booze, and mineral water, and the launch of their revolutionary book Farming Democracy: Radically transforming the food system from the ground up! As we all watch in horror as our rivers die from mismanagement and greed that is built into industrial capitalist agriculture, there’s never been a more pressing time to work towards agroecological futures. All encouraged to attend so that those of us in the engine room for radical transformation can catch up to some tunes and raise a toast to the future we’re trying to grow! Note that AFSA members get a 10% discount on tickets – just email admin@afsa.org.au for the discount code. Where: The Woodshed, 21a Raglan Street, Daylesford. by ecologist and environmental photographer, Alison Pouliot. 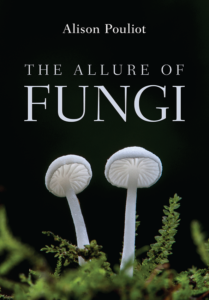 mycologists and naturalists, to foragers and philosophers. 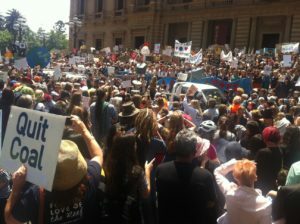 near absence in Australian ecological consciousness. Discounted copies of the book will be available for purchase. When: Saturday 9th of February, 9.30am – 3.00pm. 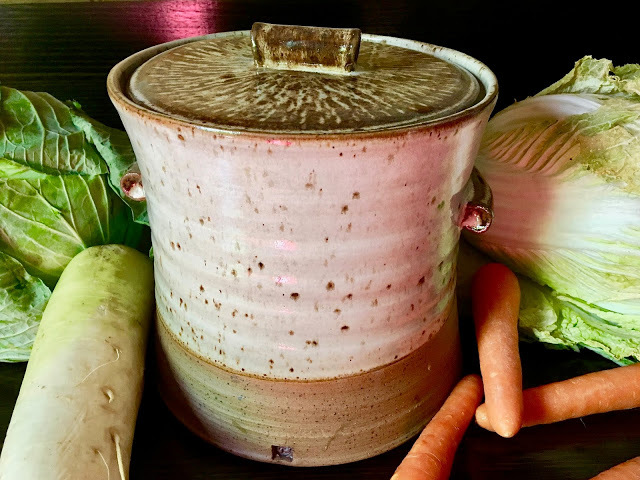 Local ceramicist Kim Haughie will show participants how to make a lidded fermenting crock pot using coil and slab construction techniques. The pots will then be dried and bisque fired and participants will then return for an additional one hour session (time and date TBA) to glaze their pots which will then require another firing. Kim Haughie has been working for over 10 years in her clay medium as a ceramic artist and makes refined yet earthy functional pieces with a sculptural element. 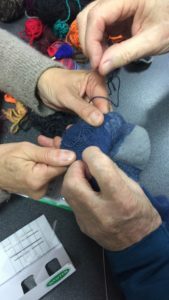 Kim is also passionate about creating a stimulating and supportive environment for others to explore their own innate creative abilities in clay. Kim is excited to be able to present this workshop as she has studied the ancient technique of Korean ongii (earthenware pottery) making in South Korea which she will briefly discuss and demonstrate. We need a minimum of four participants for the workshop to go ahead, and a maximum of eight. What’s ‘degrowth’ and a degrowth approach to future sustainability? As part of the National Sustainable Living Festival 2019, the Melbourne launch of Housing for Degrowth: Principles, Models, Challenges and Opportunities follows 29 housing for degrowth book events in Europe. This Routledge Environmental Humanities Series book has 25 international activist-scholar contributors, including four Australians. Explaining and debating ‘degrowth’ in cities and housing is lead editor (and Castlemaine resident) Associate Professor Anitra Nelson; Professor Jago Dodson, Director of the Centre for Urban Research at RMIT University; Libby Robin, Emeritus Professor at the Fenner School of Environment and Society at the Australian National University; Brendan Gleeson, Director of the Melbourne Sustainable Society Institute at Melbourne University; and Terry Leahy, conjoint in the School of Humanities and Social Science, University of Newcastle. 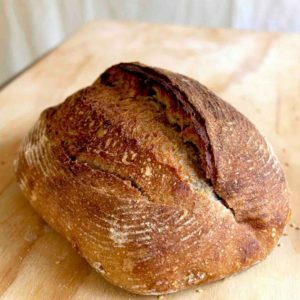 TwoFold Bakehouse is starting up a community supported bake (CSB) subscription in March, meaning fresh bread mid week (Wed) and a loaf (or two) with your name on it. Committing to a month of bread with us represents much more than bread. As a member you complete our small bread family of bakers, farmers and millers who believe in regeneration and real bread. Join us in saying no to waste, by baking only to order. Our first month of once weekly bread starts Wednesday 6 March. 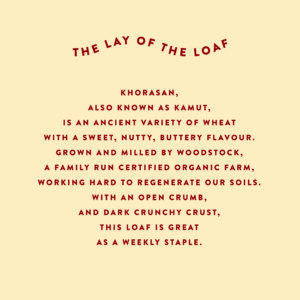 We’ll be baking a Light Khorasan loaf (wholemeal) (see picture below for the lay of the loaf) for $7 each. Pick up is from Daylesford from 3:30 – 7pm each Wednesday. For the rest of your specialty bread, TwoFold Bakehouse will still be at the Daylesford Sunday Farmers Market each week. As a bread family member, the bakehouse will also guarantee that your Sunday Market loaves are put aside so you don’t miss out – just make a note of this in your sign up email. An inspiring array of music, performance, dialogues, film, visual arts and more. Many events cost but there are free events as well. Serge at Blampied is preparing delicious organic veggie boxes, available weekly for $40. Pick up from Hepburn Springs. A great way to support our local organic and regenerative farmers. • generate and share lessons on good practice approaches to community adaptation. 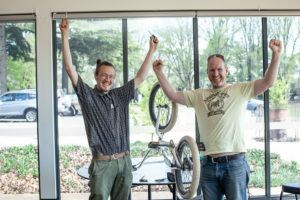 In the Live Ecological newsletter, prepared by Bendigo’s Ian Mc Burnie, (sustainability practitioner, one of the founders of Bhive Cooperative), Ian shares a poignant letter to his young nephew- Dear Alexander- about a future that people are worried about. Richard Flanagan writes a compelling reflection on the impacts of climate change in Tasmania in Tasmania is burning- The climate disaster future has arrived while those in power laugh at us.